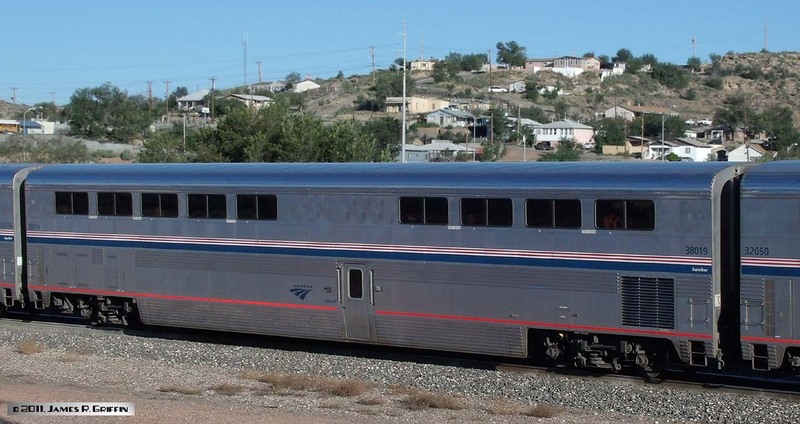 Amtrak’s high-level Superliner cars were inspired by the Santa Fe’s unique high-level Budd cars used on its El Capitan train beginning in 1956. 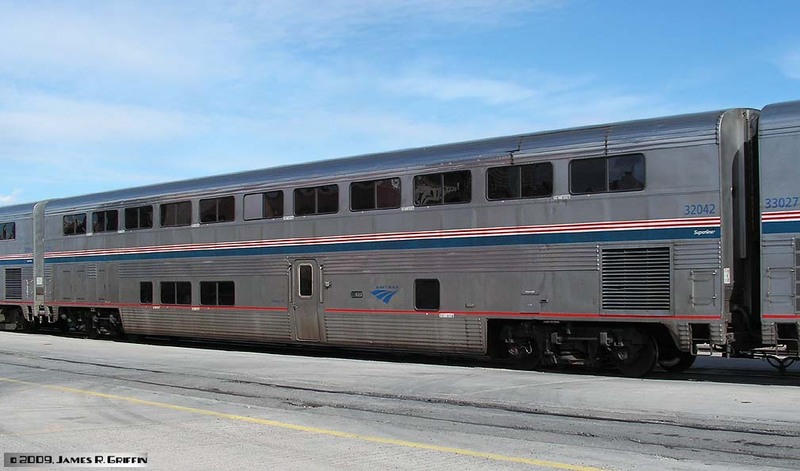 As with the El Cap cars, The diaphragms are located at the upper level, making them incompatible with standard passenger cars without the use of a “transition” car, i.e. one with a low-mounted diaphragm on one end. 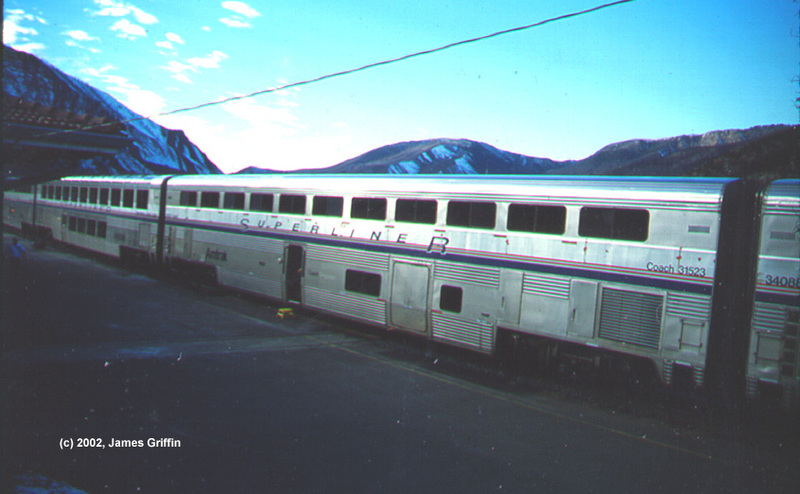 Superliner cars were delivered in two major groups. 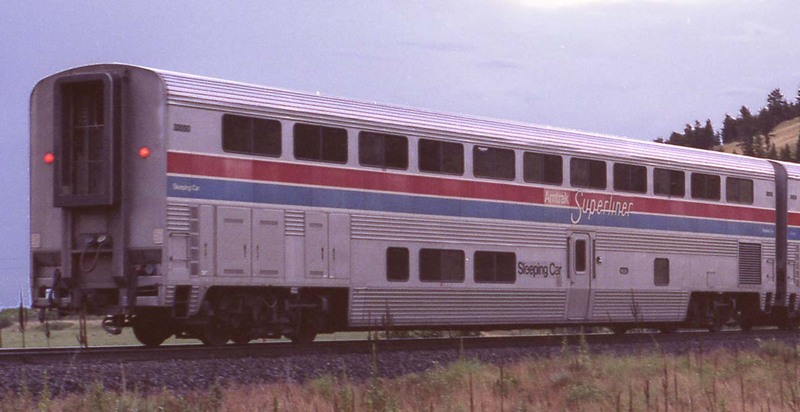 The first batch, built by Pullman-Standard, began arriving in 1979 and are now referred to as Superliner I or S1. 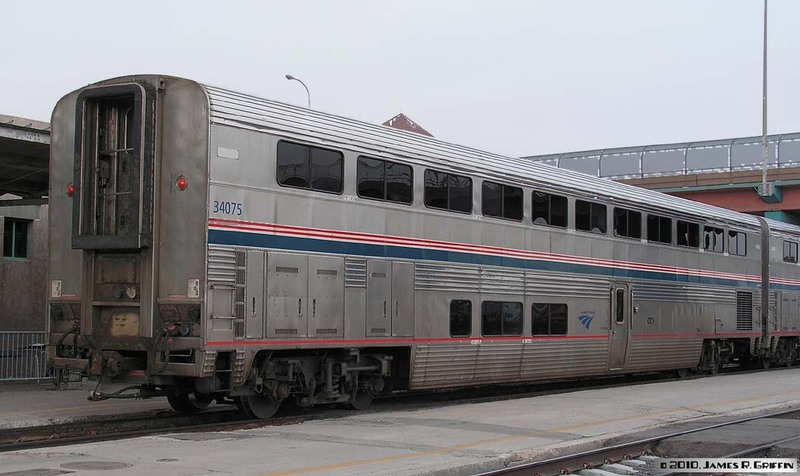 The second order was built in 1993-94 by Bombardier, and are known as Superliner II or S2. 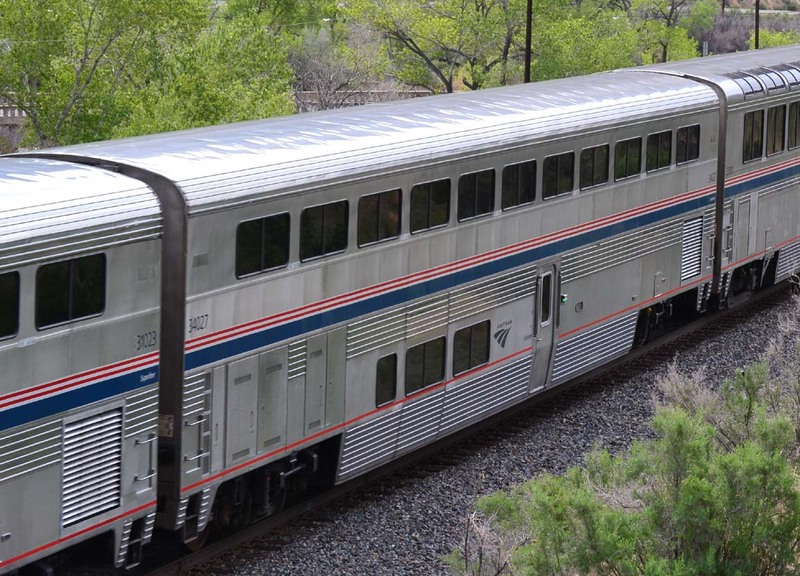 They are used primarily on the Western long-distance trains (i.e. 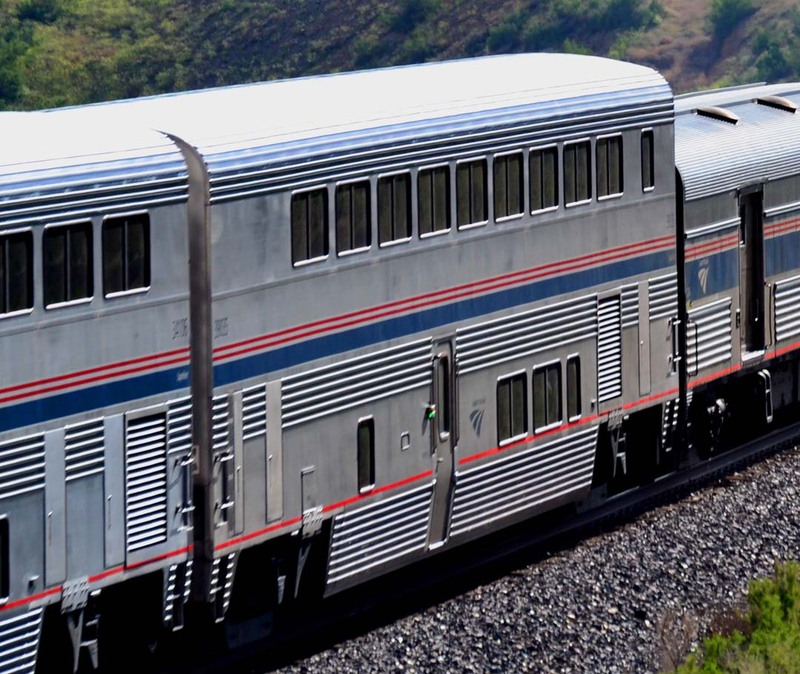 Empire Builder, California Zephyr, Southwest Chief, Sunset Limited), in California, and on the Auto Train. 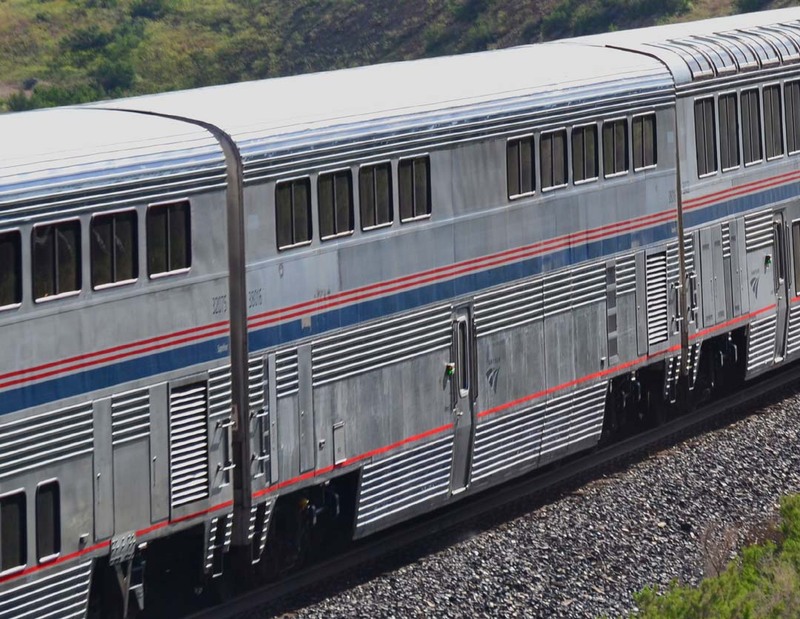 They (and variants) also show up on California Surfliner trains. A convenient spotting feature is the trucks. The S1 equipment all came on coil-spring trucks (initially with airbags in the coil). These trucks have an unconventional look to them, and much of the wheel face is exposed. The S2’s, on the other hand, have trucks of more conventional construction with prominent low-hanging sideframes. 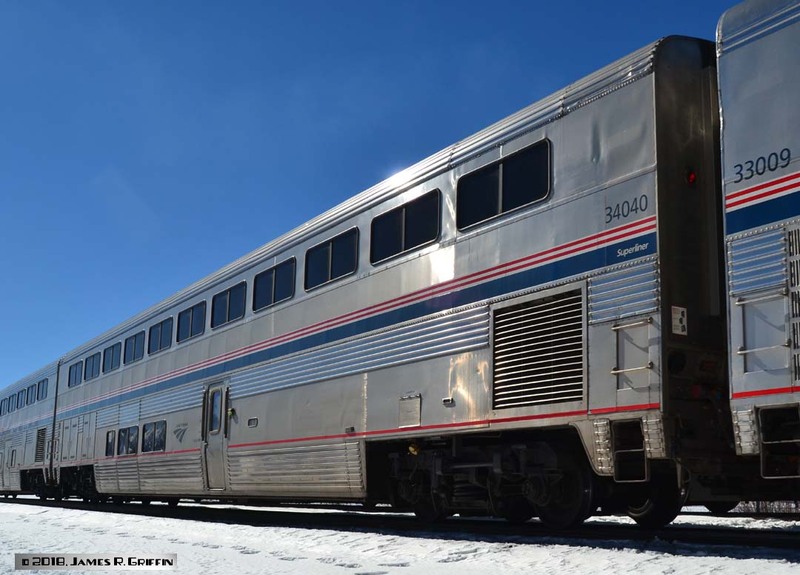 There are five main types of cars, with a couple of variations within type: coaches, sleepers, transition sleepers, diners, and lounges. 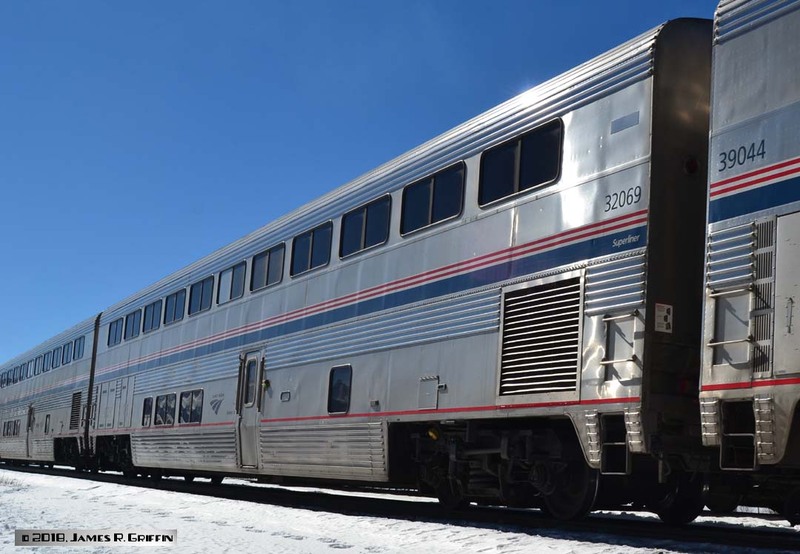 The transition sleepers all arrived with the S2 order, as they were built to replace the aging El Cap transition cars. 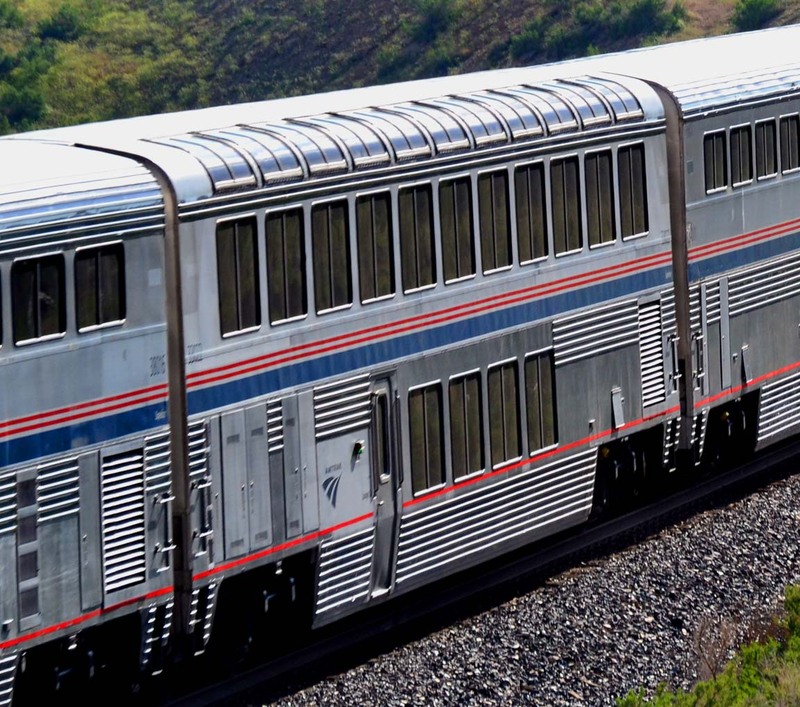 At a distance, Superliners look pretty much the same. However, there are some things to look for to aid you in identification. • S1 or S2? A convenient spotting feature is the trucks. The S1 equipment all came on coil-spring trucks (initially with airbags in the coil). These trucks have an unconventional look to them, and much of the wheel face is exposed. The S2’s, on the other hand, have trucks of more conventional construction with prominent low-hanging sideframes, and a triangular stabilizer structure projecting down from the car sill. • If there is a lot of glass above the main line of windows, it’s a lounge. End of story. • If there is a large blank space between the windows at the center of the car– two window-widths of metal– it’s a diner. (Sometimes there will be windows here that have been blanked over, for some early conversions, but I haven’t seen a car like this in a very long time.) Diners also have no windows on the lower level. • If there is a small gap in the middle of the car and a single small window at one end, this is a transition sleeper. This car will also nearly always be at the front of the train, just behind the baggage. It also has its end diaphragm on the lower level at the same end where the small window is. • If there are windows on both sides of the door on the lower level (and it’s not a LOUNGE), then it’s a sleeper. 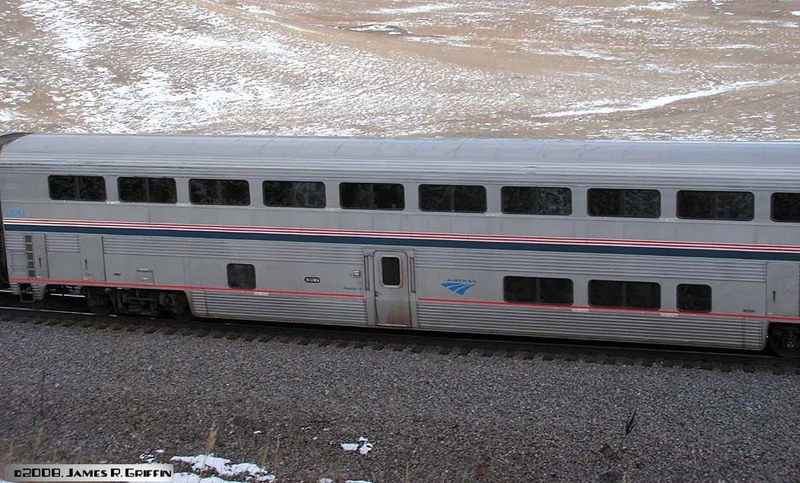 Some S1 sleepers also have a half-window blanked on one side of the upper level. • Everything else is a coach of some kind. 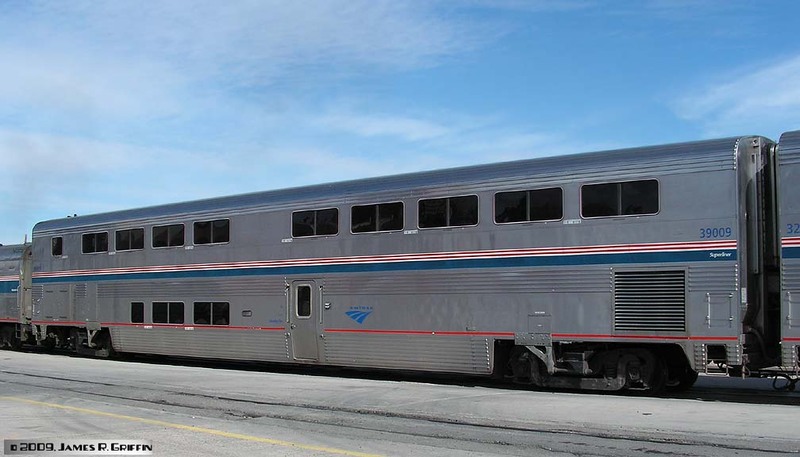 An additional large door in the side indicates a Coach/Baggage, and the lower windows will be blanked as of this point in time. 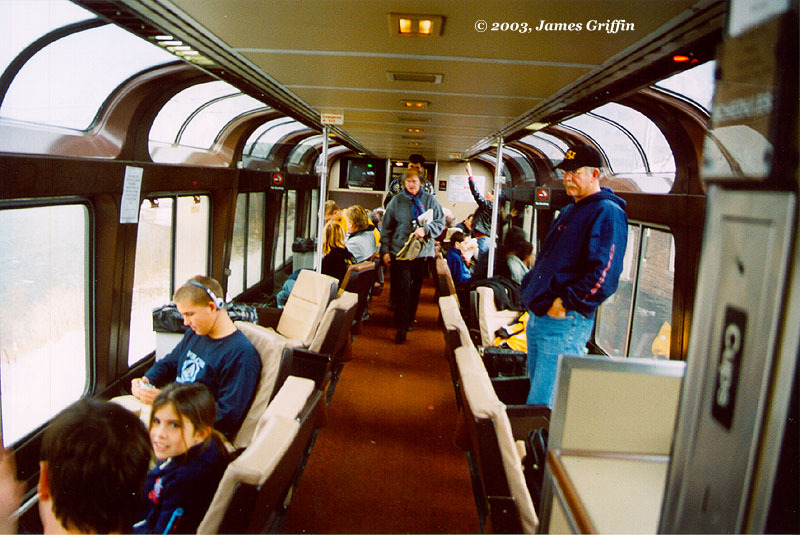 All other coaches have a group of windows on the lower level, either right or left of the door, but not both. Keep in mind that all cars have a window in the entry doors on the lower level. Ignore these for spotting purposes. The tables below show the number series of the various car types. Hot-linked numbers will take you directly to my photo(s) of that car, below the tables. Numbers with strikethrough are shown as wrecked. Some may have been rebuilt or otherwise salvaged. 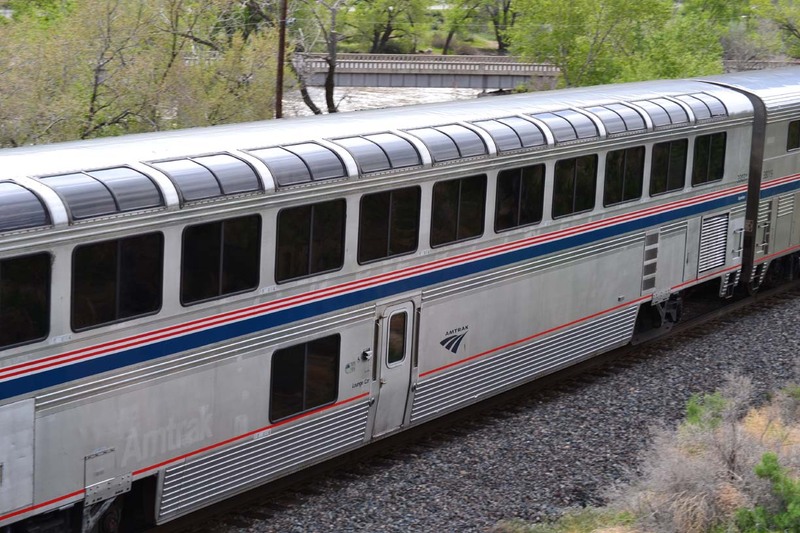 Coaches and coach/baggage cars are in the following number series. 31027, which also apply here.Top: at Gallup on train No. 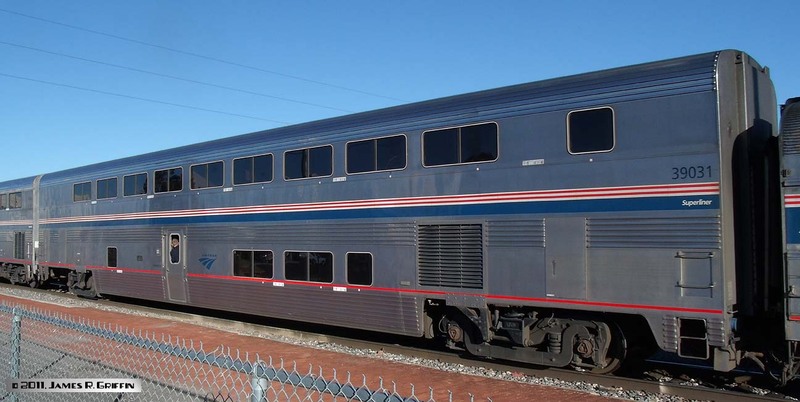 4, 9/24/2011.Bottom: opposite side, at Denver on train No. 5, 12/16/2014. Coach/Baggage 31020, on No. 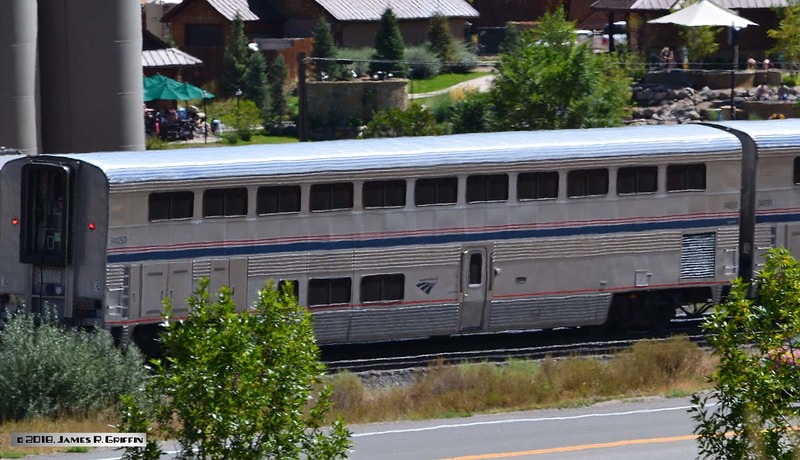 6 entering Glenwood Springs on 9/01/2018. 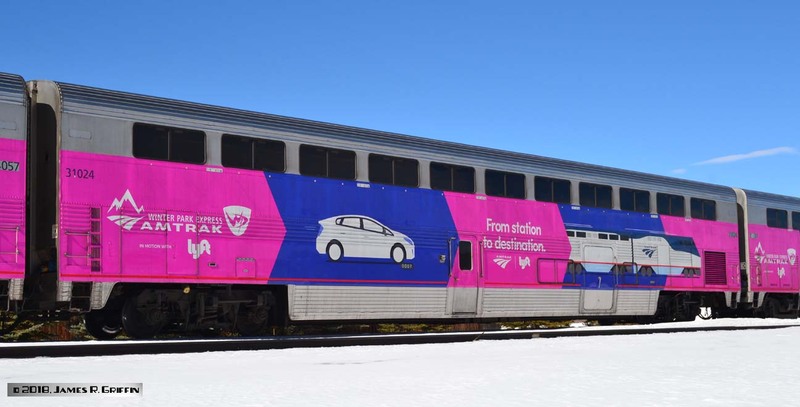 Coach/Baggage 31024, dressed in a Lyft ad-wrap for the Winter Park Express on 2/18/2018. This and two other cars were so adorned for the 2018 season. Coach/Baggage 31027, on No. 5 at Clay (now Eisele) siding on 12/6/2008. Coach/Baggage 31033 is trailing on No. 5 at Fraser, 2/18/2018. Top: in Albuquerque on 2/26/2009. 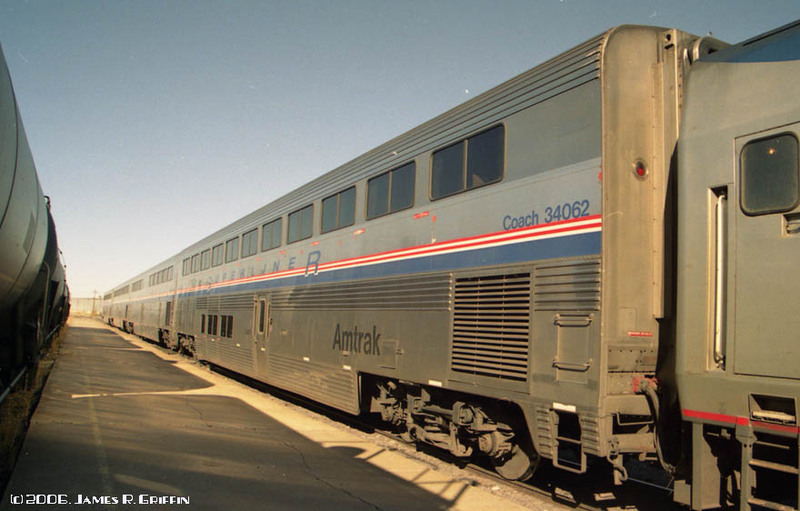 Note that it’s still wearing standard Phase IV lettering, and is labeled as “Coach Smoker”, but has actually been modified back to a coach/baggage configuration. Bottom: Now in phase IVb, it’s running on the Winter Park Express on 2/18/2018. 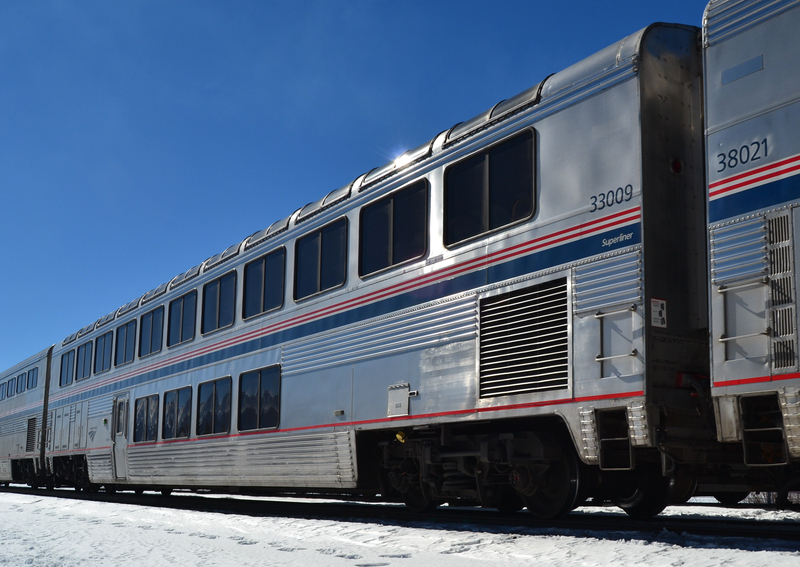 Coach/Baggage 31041 at Fraser, CO on the Winter Park Express (2/18/2018). 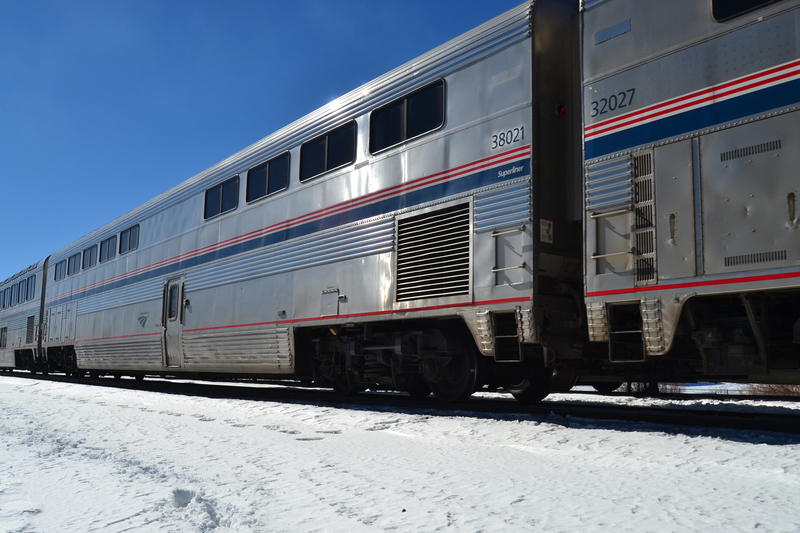 Coach/Baggage 31045 at Fraser, CO on the Winter Park Express (2/18/2018). S1 Coach 34027, oblique view. 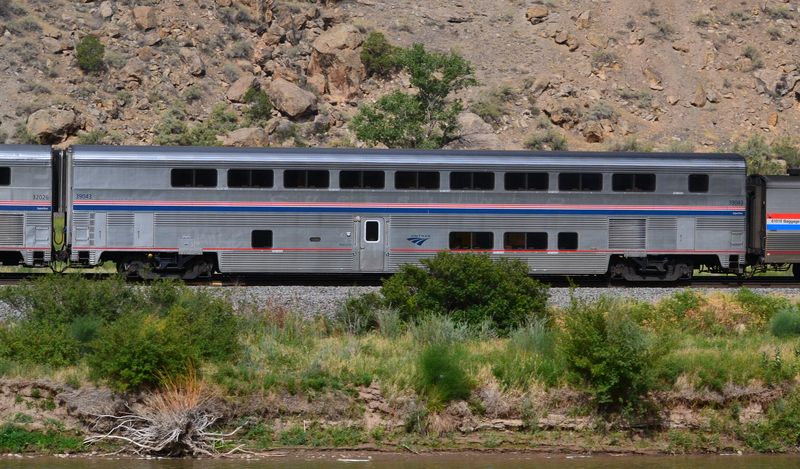 It’s eastbound at Palisade, CO on 4/28/2014. S1 Coach 34040, on No. 5 at Fraser, CO (2/18/2018). S1 Coach 34050, on No. 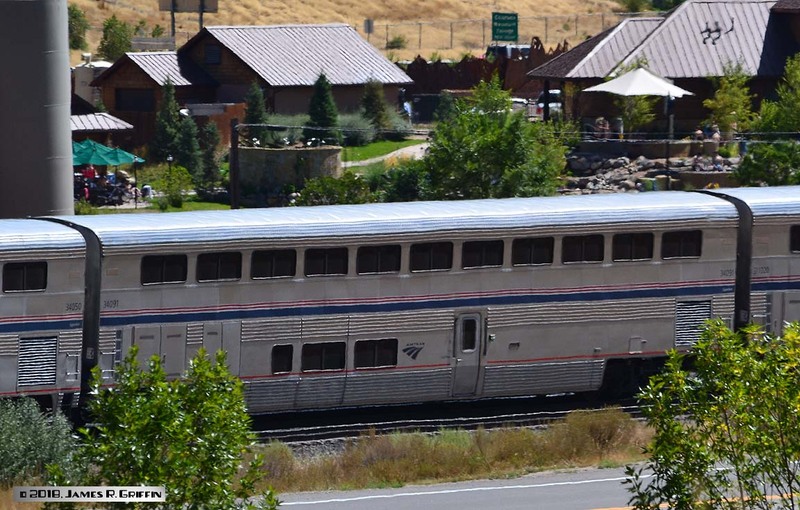 6 entering Glenwood Springs on 9/01/2018. S1 Coach No. 34056, in Denver, train No. 5, 12/16/2014. S1 Coach 34057, dressed up for the 2018 Winter Park Express. It’s a composite image (can you tell?). It’s sitting in the siding at Fraser on 2/18/2018. S1 Coach No. 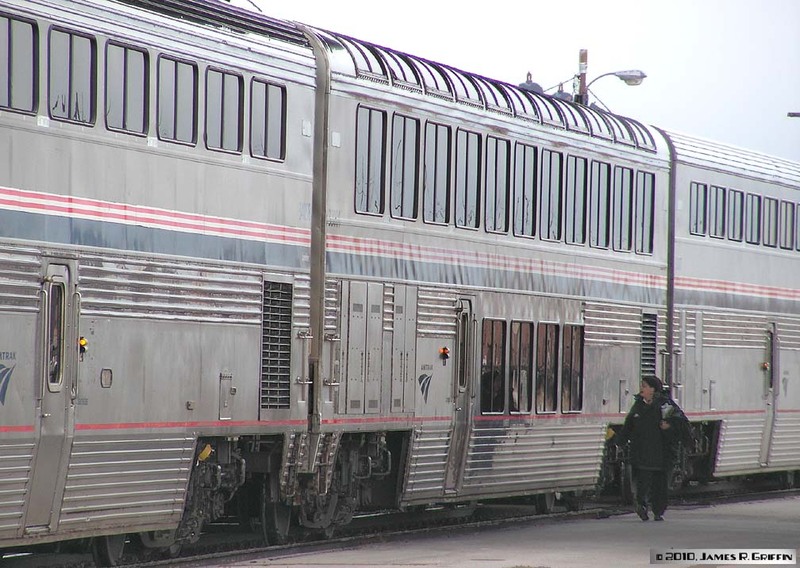 34062 is seen on the California Zephyr at Grand Junction, CO on 1/05/2006. 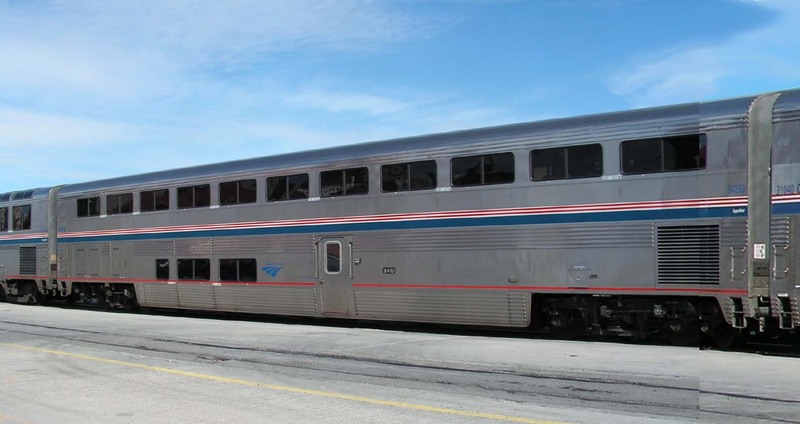 On this day the train was being run as a stub operation west of Denver, turning at Grand Junction, and as such was run without sleepers, baggage car, or lounge. Three coaches and a diner behind two P42DC’s were the entire train. The announced reason was because of flooding in California, although why they didn’t run through to Salt Lake was not explained to me. 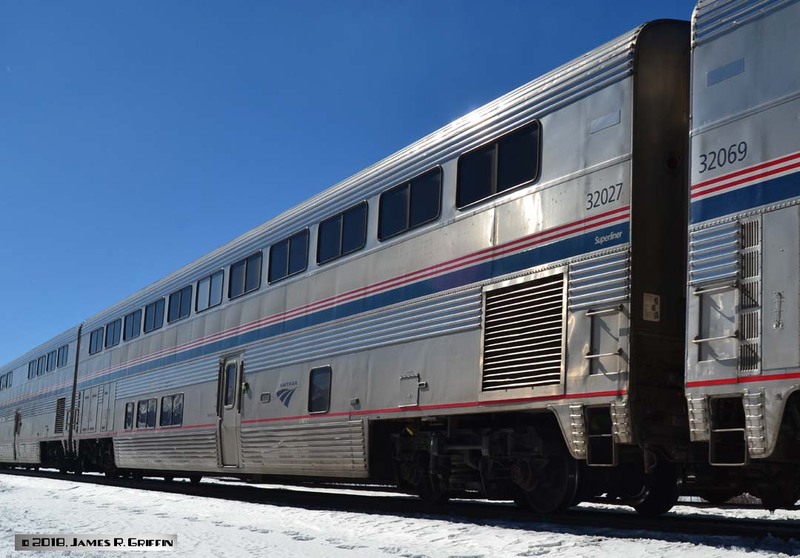 S1 Coach 34075, last car on the Southwest Chief in Albuquerque on 2/7/2010. S1 Coach 34090, at Albuquerque on 2/26/2009. Wearing Phase IVb. S1 Coach 34091 on No. 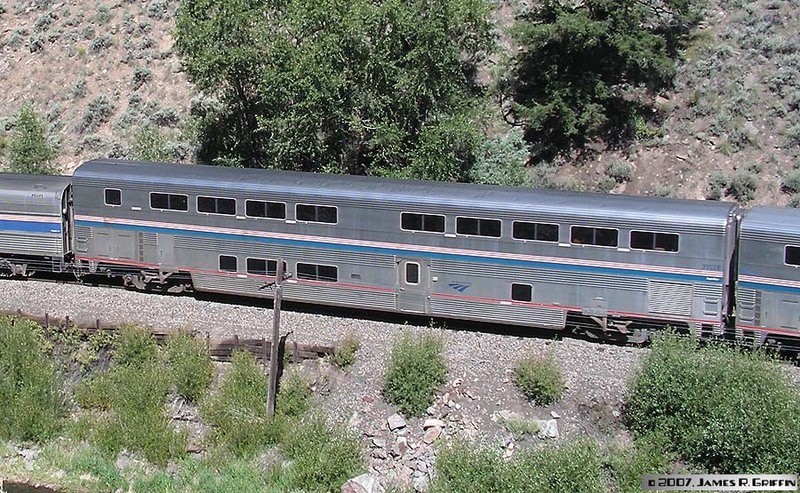 6 entering Glenwood Springs on 9/01/2018. Snack bar car 35001. Built in 1979 as a 74 seat coach numbered 34003. 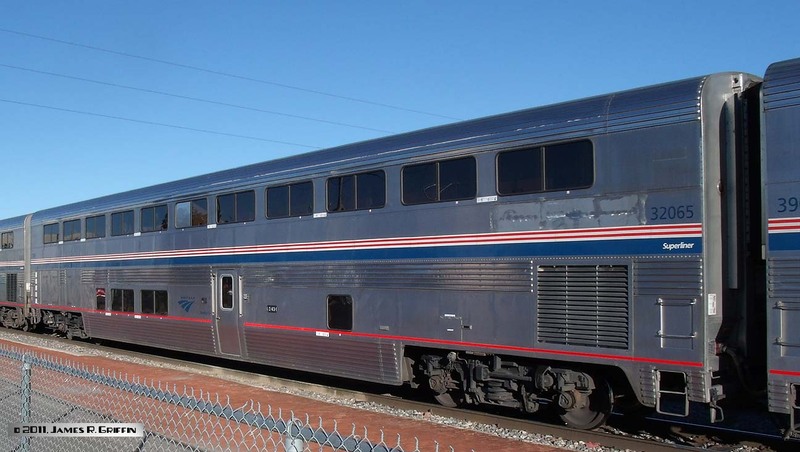 The 12 seats in the lower level of the car were removed and the space converted to a snack bar by November 1980 and the car renumbered as shown. 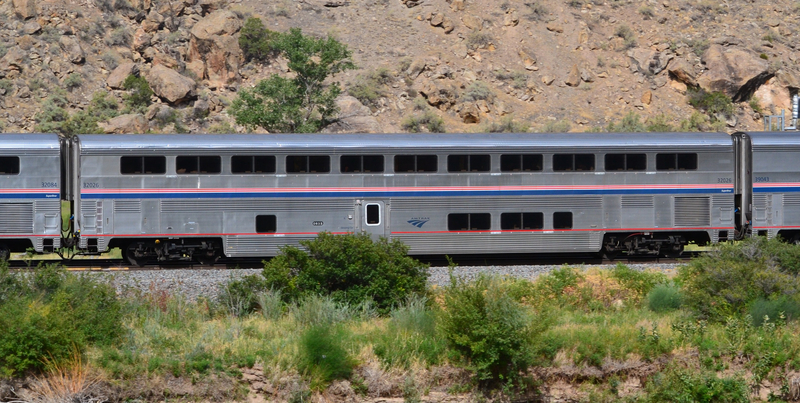 S2 coach 34120, at Gallup on 9/24/2011. S2 coach 34133, on train No. 5 on 12/16/2014. 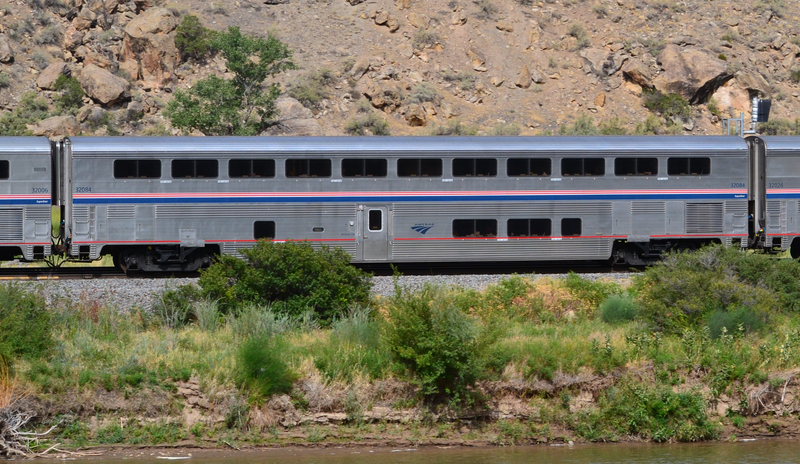 S2 coach 34134, at Gallup on 9/24/2011. Phase IVb stripes. S2 Coach 34135 on No. 6 in Debeque Canyon on 9/03/2018. The car is on the plate-girder bridge over Cottonwood Creek; the Colorado River is in the foreground. S2 coach 34137, ad-wrapped for the 2018 Winter Park Express. At Fraser, Colorado on 2/18/2018. Sleepers were delivered in in the following series. S1 sleeper 32026 on No. 6 in Debeque Canyon on 9/03/2018. S1 sleeper 32027, on No. 5 at Fraser on 2/18/2018. Note the banked window. S1 sleeper 32042, in Albuquerque on 2/26/2009. It seems to have had some kind of repair done on the roof towards the right end. Wearing Phase IVb, which is probably the fourth paint scheme for this car. S1 Sleeper 32044 brings up the markers on No. 5 at Westwater, Utah (4/27/2014). 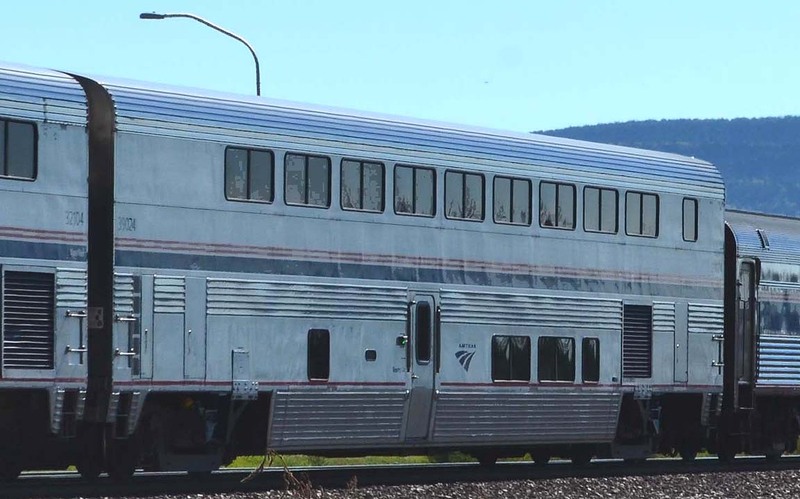 Oblique angle but we get a good look at the end of the car.This particular run featured (in order) a transition sleeper at the head end, two coaches, lounge, diner, and these two sleepers on the tail. Same car, 25 years later (9/24/2011) in Gallup, now it’s in Phase IVb. than the stripe. 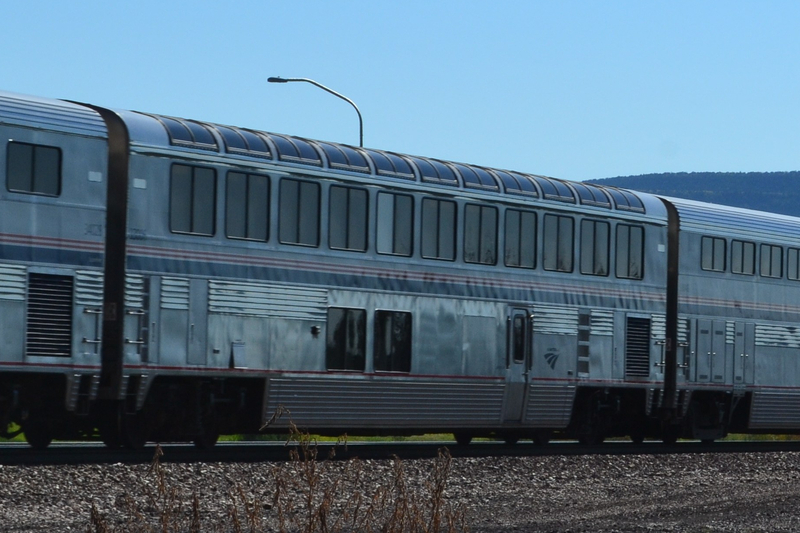 The light-blue letters on the silver background can be very hard to read in certain light.In all likelihood this is the fourth paint scheme this car has worn (see 32050 above for a look at the original Phase II scheme). 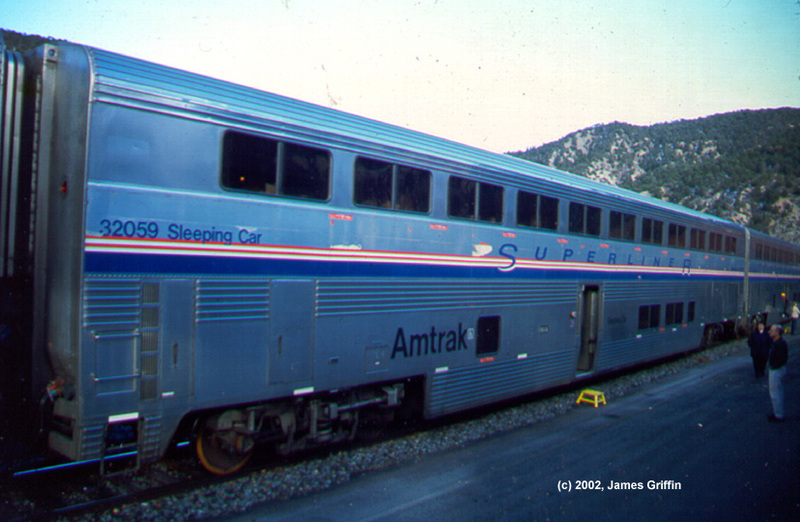 S1 Sleeper 32059, at Glenwood Springs on 11/30/02. The former paint scheme is showing through in places. Top: in Gallup on 9/24/2011. 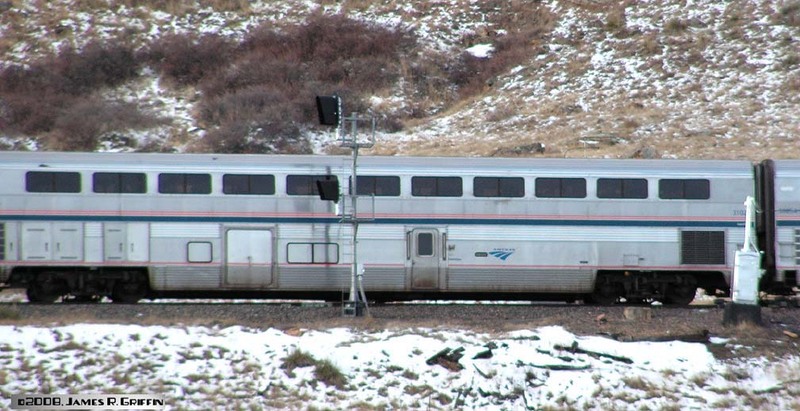 Note the panel adjacent to the car number; it seems to have received a repair job at some point.Bottom: Opposite side, in Denver on 12/16/2014. Note the half-blanked window in center, which corresponds to the S2 half-size window. S1 sleeper 32069 at Fraser on 2/18/2018. You can see the half-blanked window in the middle. 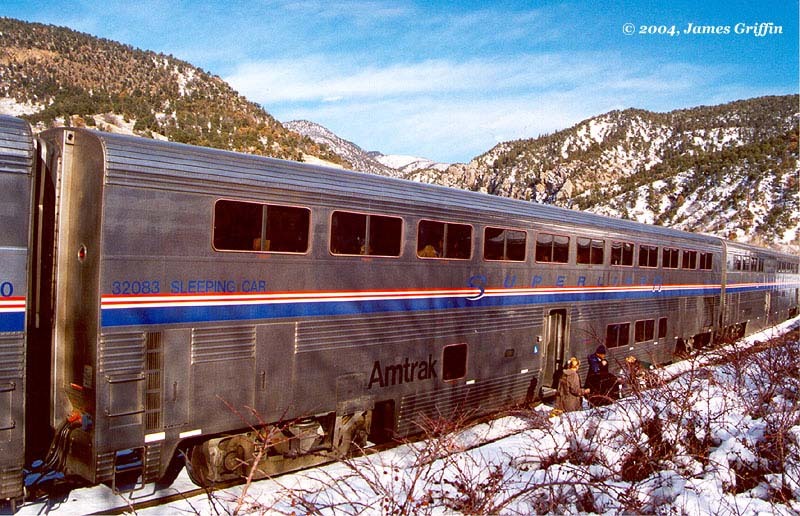 Top: At Glenwood Springs on New Years day 2004. Here it’s shown in phase IV and carrying the name “IOWA”. 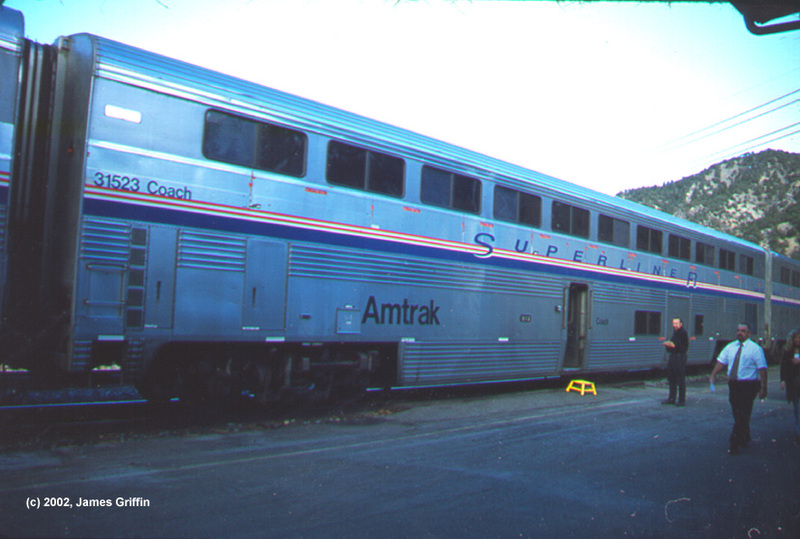 S2 sleepers were originally named for states. Bottom: On No. 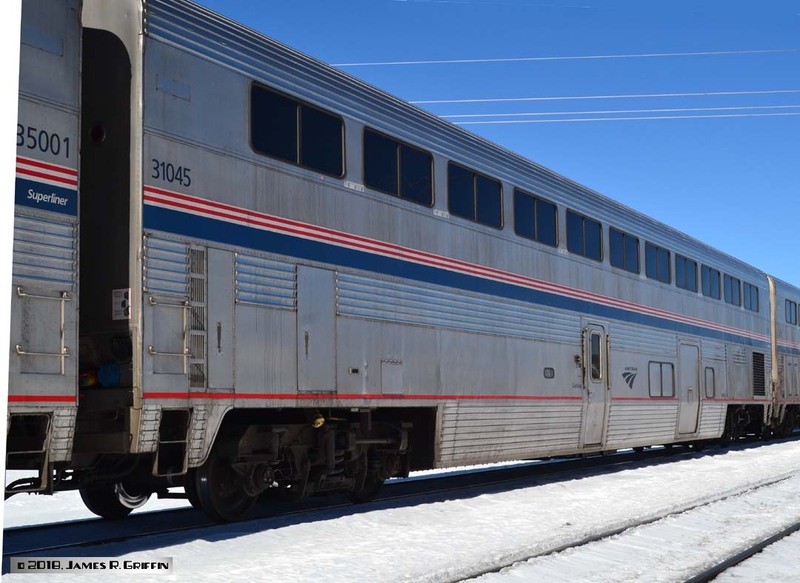 5 passing Utah Junction in Denver, now in phase IVb (12/16/2014). S2 sleeper 32084 on No. 6 in Debeque Canyon on 9/03/2018. S2 Sleeper 32086, at Albuquerque on 2/26/2009. S2 Sleeper 32113 (and 32115 as well), in Seattle on 7/24/2009. Transition Sleeper 39009, at Albuquerque on 2/26/2009. It’s now in Phase IVb. 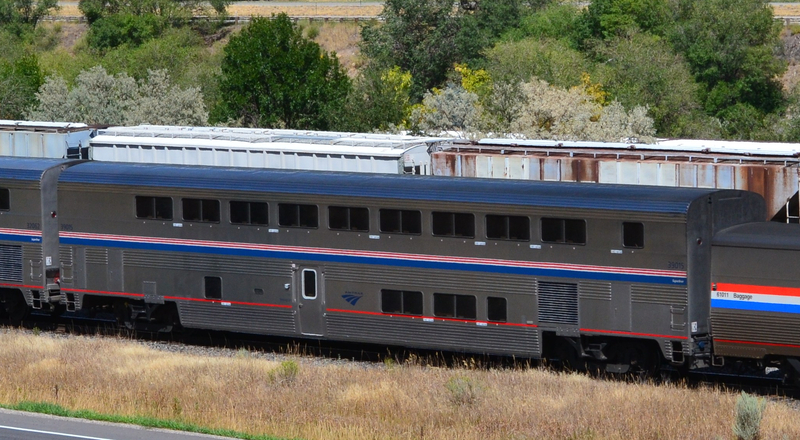 Transition Sleeper 39015 is rolling into Glenwood Springs on No. 6, 9/01/2018. Transition Sleeper 39024. It’s on No. 4 passing through Grants on 8/29/2015. Transition sleeper 39026 on train No. 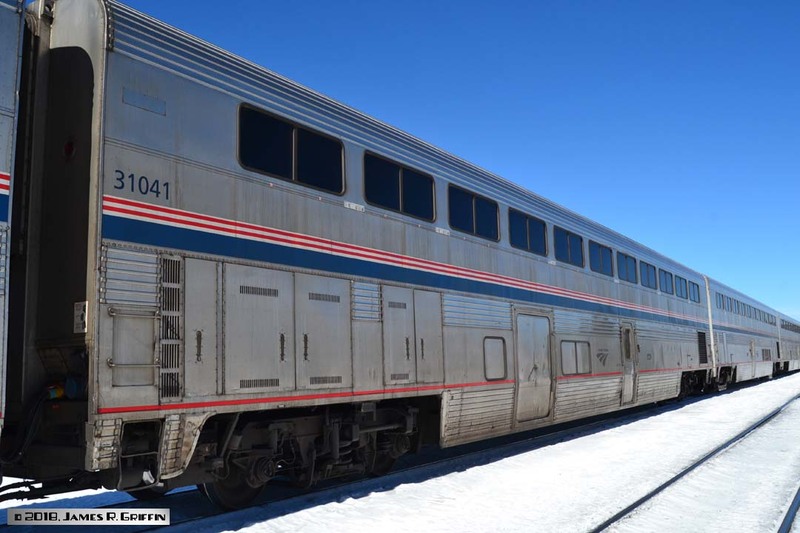 5, leaving Denver on 12/16/2014. 8/9/2007. This was the first time I had photographed the newer, simplified Phase IVb scheme. 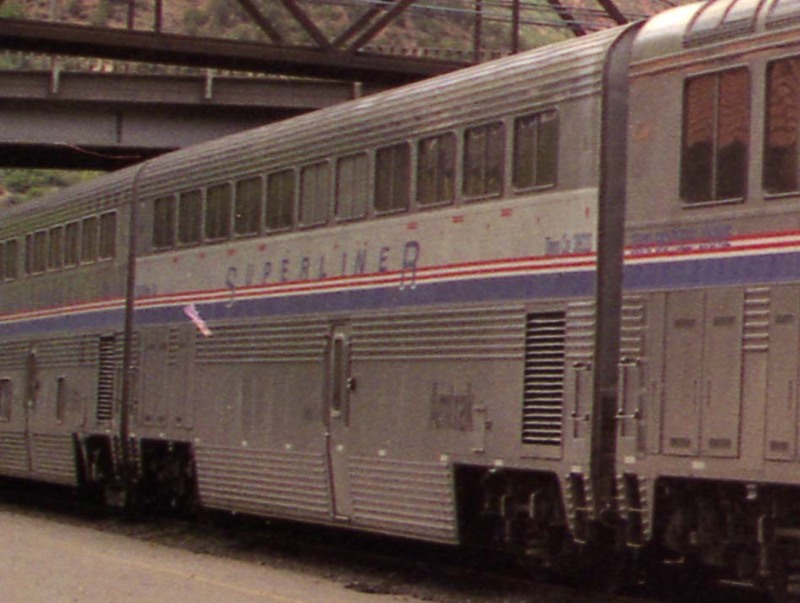 Note the lack of the scripted “SUPERLINER” lettering, and modified numbering and car identification legends. Transition sleeper 39031, in Gallup on 9/24/2011. 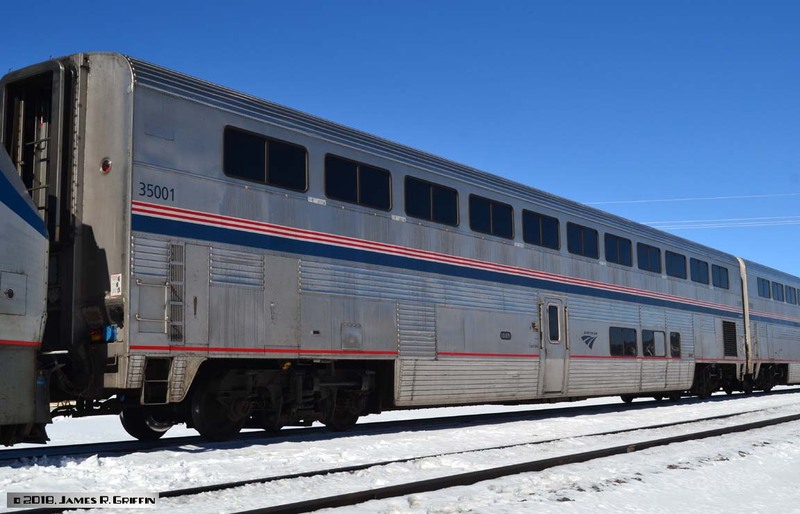 Transition sleeper 39035, at Westwater, Utah on 4/27/2014. 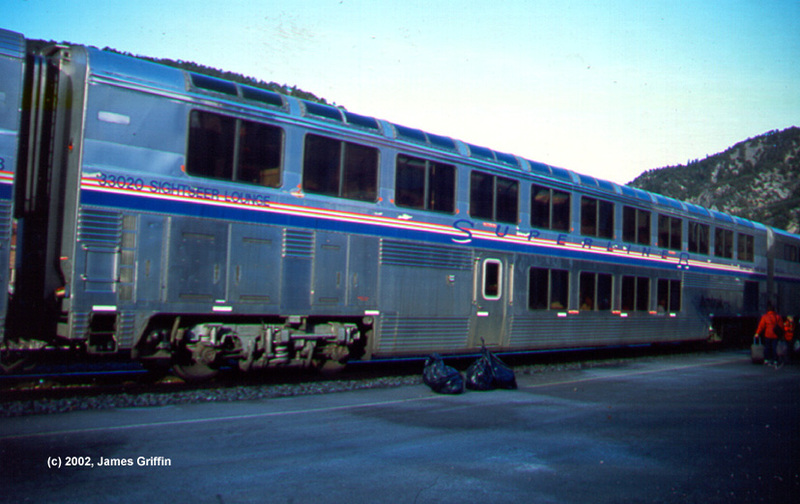 This consist was inverted, with coaches behind the transition car, and only 7 cars total. Transition sleeper 39043 on No. 6 in Debeque Canyon on 9/03/2018. Lounges arrived in the following groups. S1 Lounge 33004, in Albuquerque on 2/7/2010. 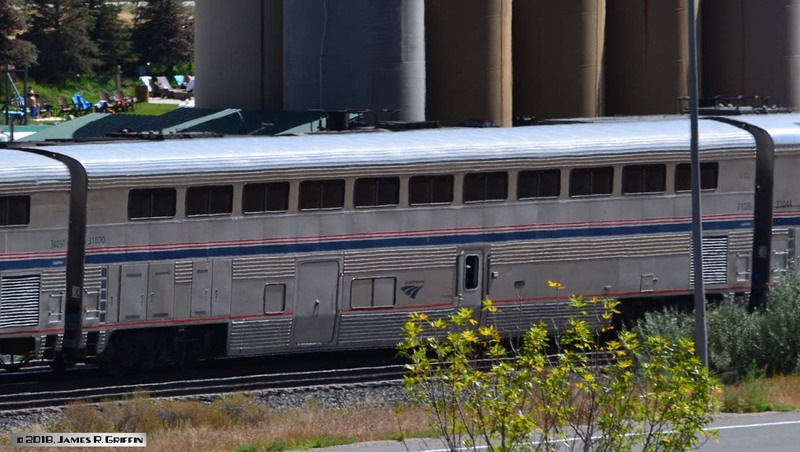 Probably the fourth paint scheme it has worn since being built in 1979… Note the four windows beyond the off-center side door– this easily identifies it as an S1, even if one cannot see the trucks. S1 Lounge 33006 (trust me) flies through Grants on train No. 4 on 8/30/2015. 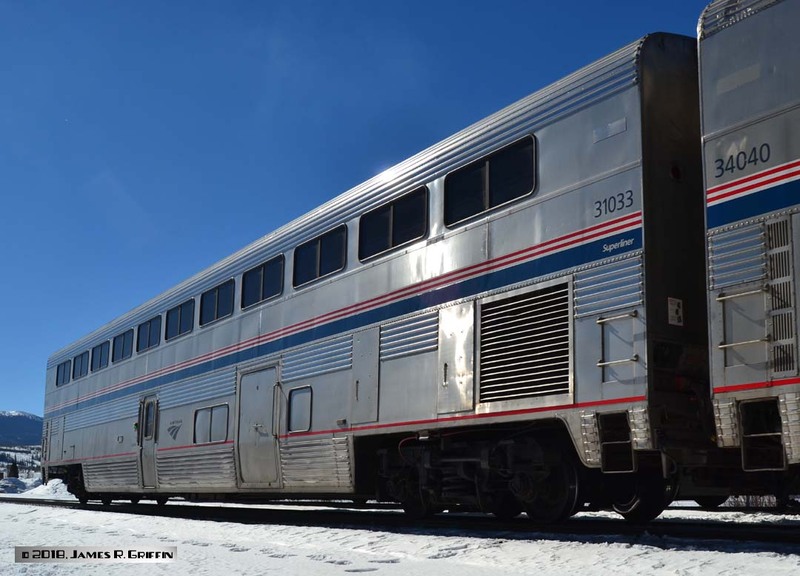 S1 Lounge 33009 at Fraser, CO on 2/18/2018. Train No. 5. 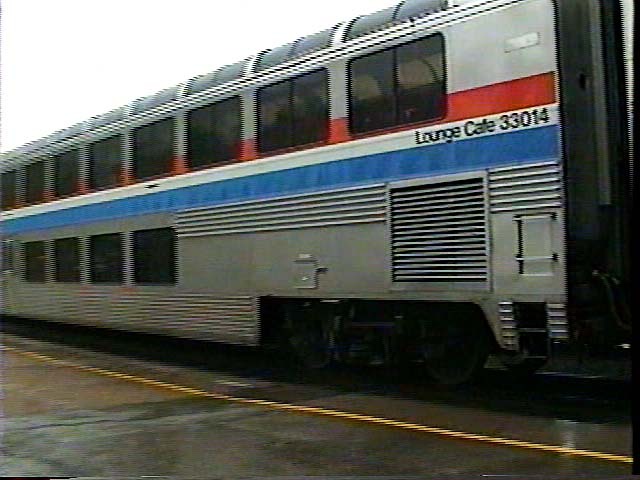 S1 Sightseer Lounge car 33013 (8/07/2001). These cars are the best place to be for the scenic portions of a trip, particularly in Colorado’s canyon country. Phase IV paint. S1 Lounge/Cafe 33014, in simplified Phase III stripes on 6/30/1995. Video capture image. It’s in the rain in Glenwood Springs. S1 Lounge 33016, at Gallup on 9/24/2011. Note that, by this date, the car numbers have been changed to a darker blue, and are far easier to read than the early Phase IVb numbers. 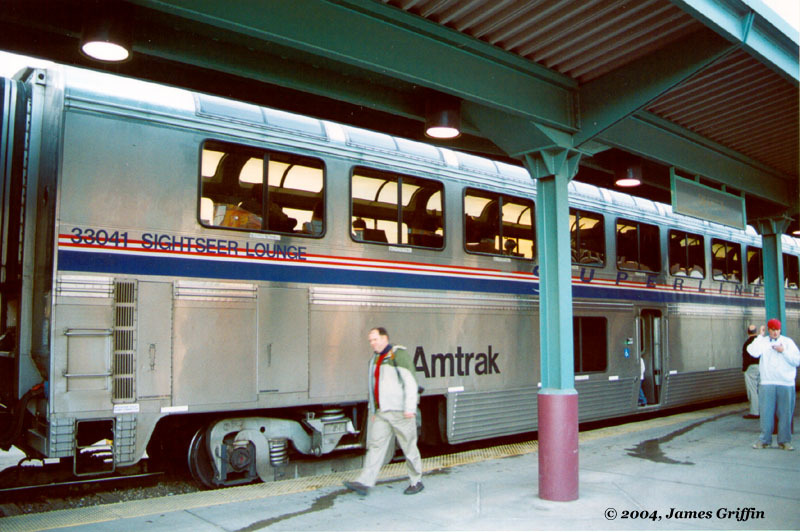 S1 Sightseer Lounge car 33020 (11/30/2002). Phase IV lettering and stripes. At Glenwoood Springs on No. 5. 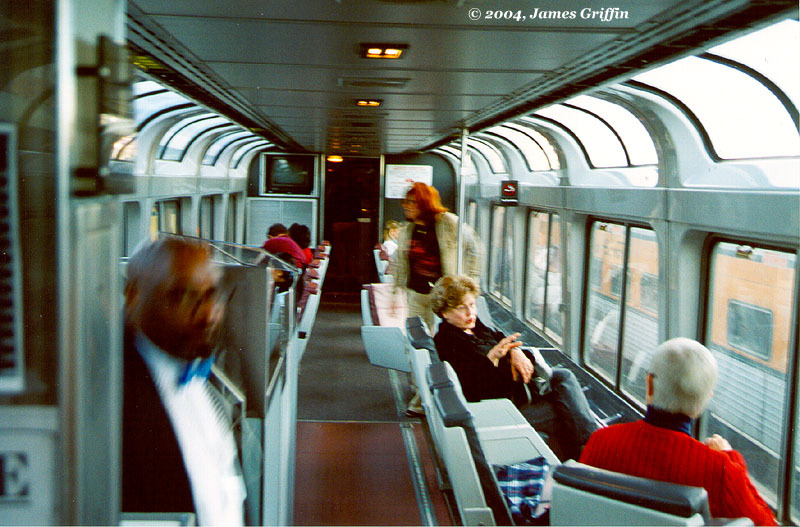 Interior of a Superliner I Sightseer Lounge car, upper level, looking the opposite direction. Stairway is just to the right. Seat cushions in these lounges were a putty-colored tan on the stationary seats (lounge clusters) in the middle of the car, and darker brown on the swivel seats to each end. 8/9/2007. It wears the then-new Phase IVb scheme with the light blue numbers, which made identification tricky. 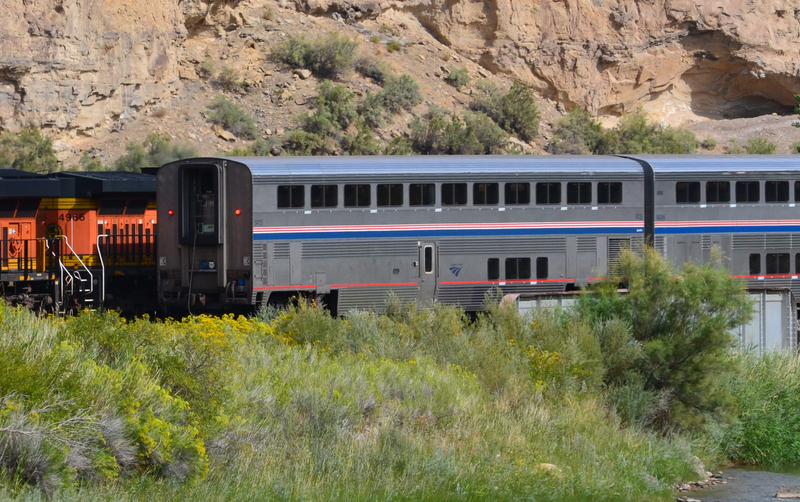 Top: at Palisade, CO on 4/28/2014 on train No. 6. 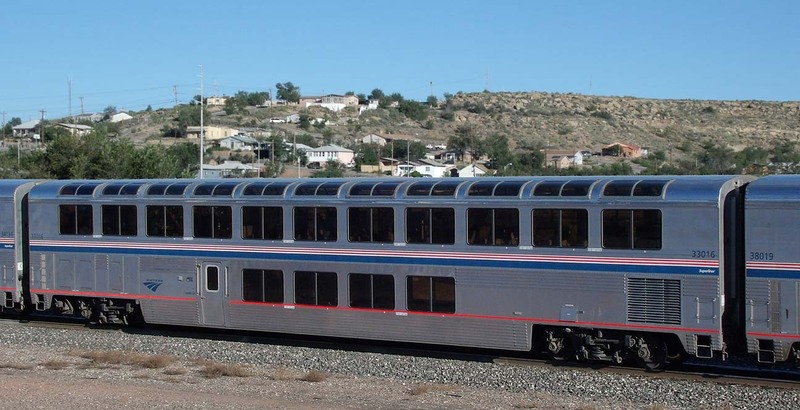 Though the entire car isn’t shown here, I found it interesting that you can easily see where all the Phase 4 appliques were peeled off– the large SUPERLINER letters, the cartype descriptors, even the word “Amtrak” . Most other cars do not show the shadows like this one does. It’s been roughly 7 years since they were removed. 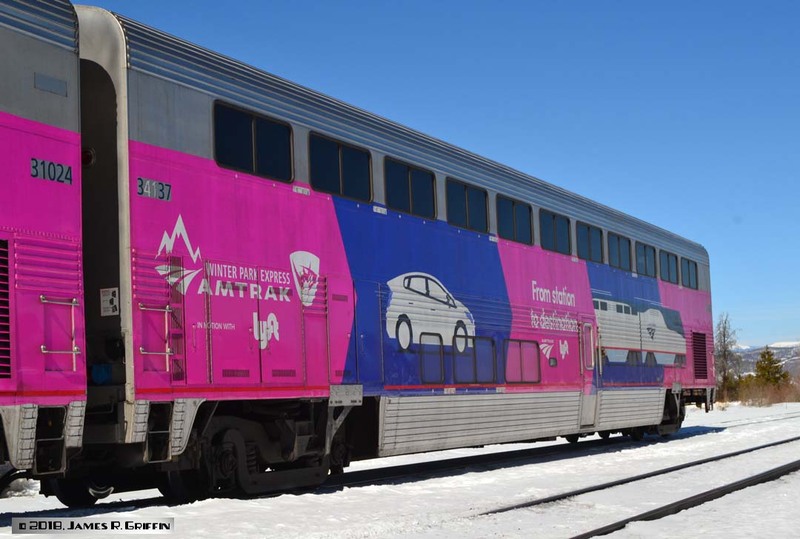 Bottom: same car, in Denver on 12/16/2014, train No. 5. 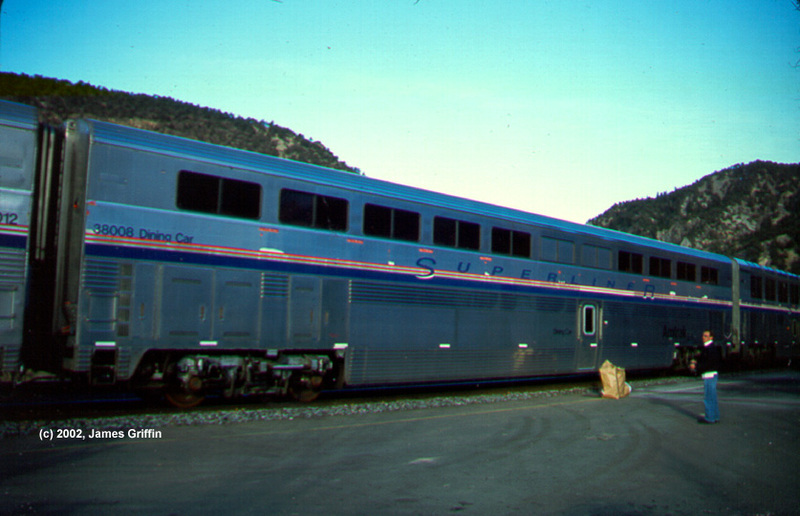 S2 Sightseer Lounge car 33041, in the phase IV scheme. 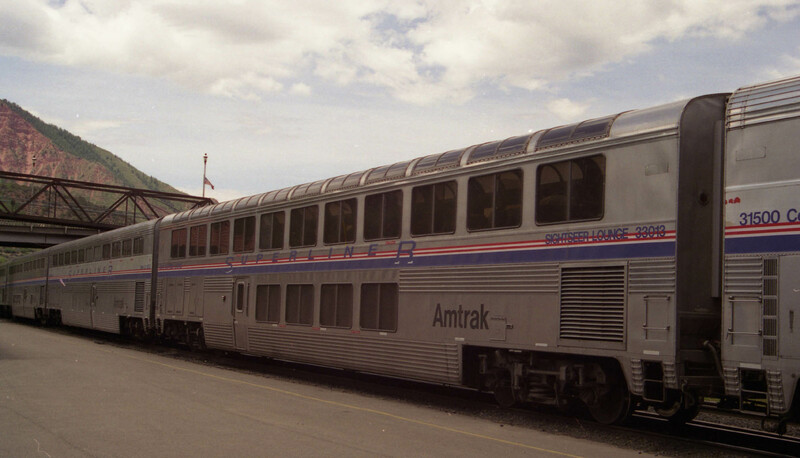 Top: Waiting at Denver Union Station on 1/1/2004. 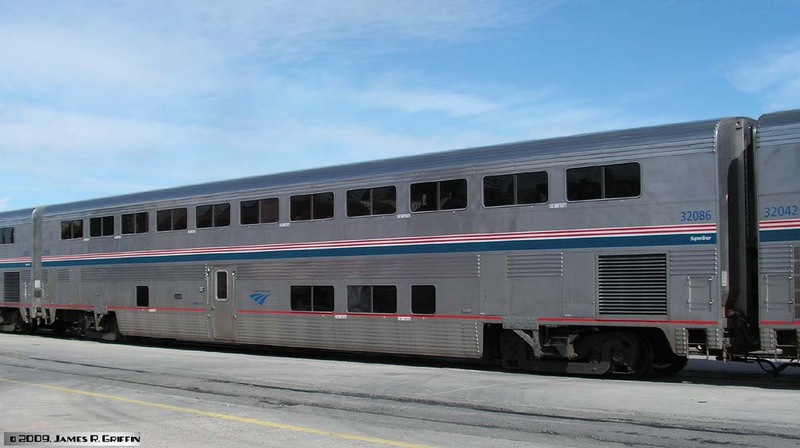 Notice that the vestibule door is more centered than as on a Superliner I, and that this side of the lower level has no windows beyond the door. 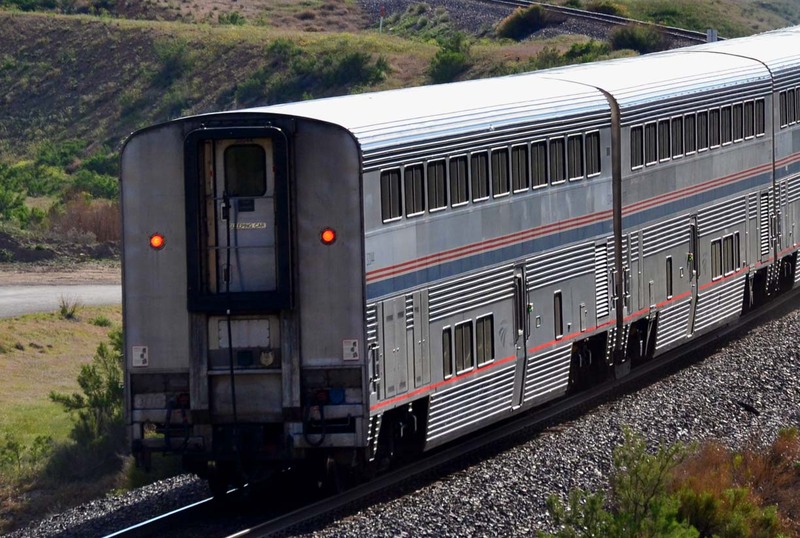 Bottom: The opposite side of Sightseer Lounge car 33041. You can see that the lower level on this side has two regular-size windows to the left of the door, plus one smaller window (in the lounge attendant’s area). 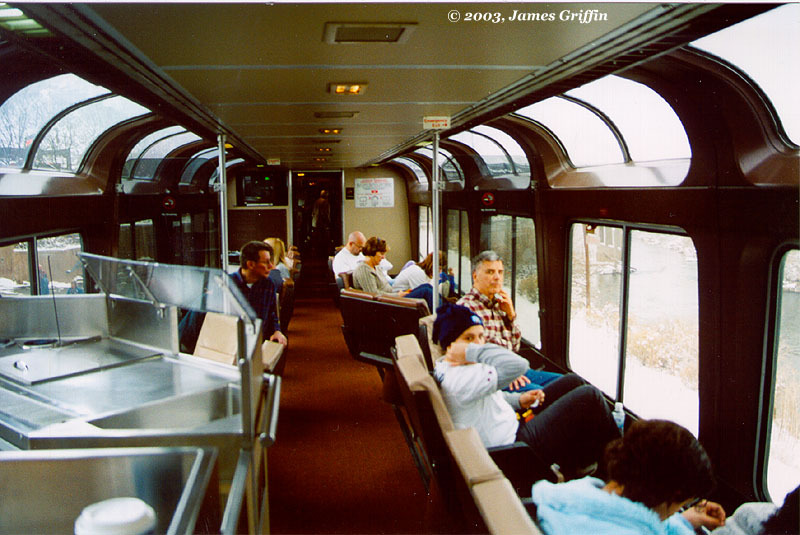 Interior of a Superliner II Sightseer Lounge car, upper level. The steward at left is coming up the staircase. 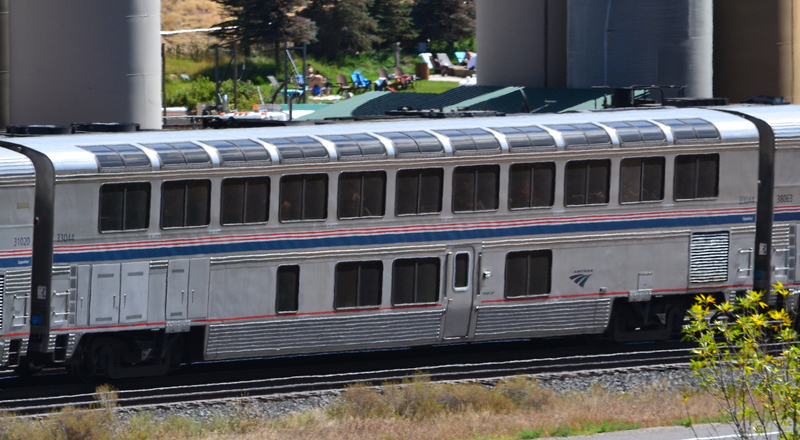 Yes, that’s the Ski Train visible out the right-hand windows; photo taken at Denver Union Station. 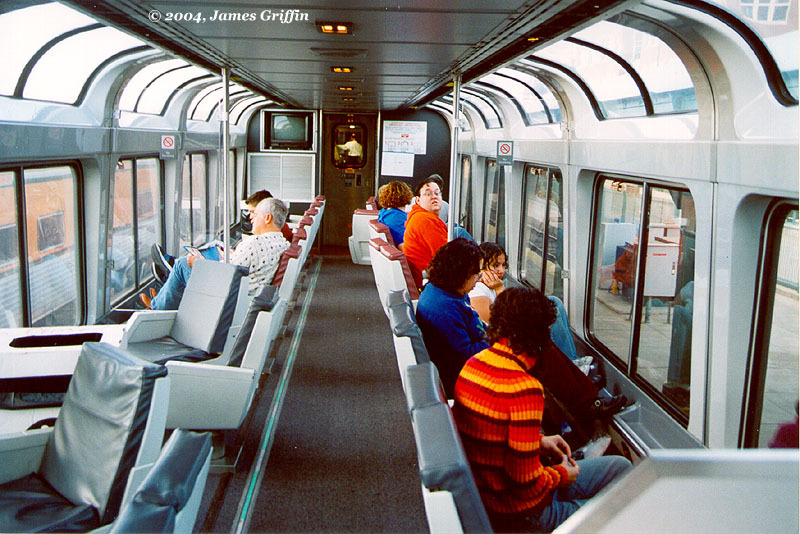 Interior of a Superliner II Sightseer Lounge car, upper level, looking the opposite direction. Stairway is just to the right. Notice the interior colors based on light gray, which is the as-built color scheme. Stationary seats (lounge clusters) typically are dark blue-gray, and the swivel seats at each end of the car are maroon. 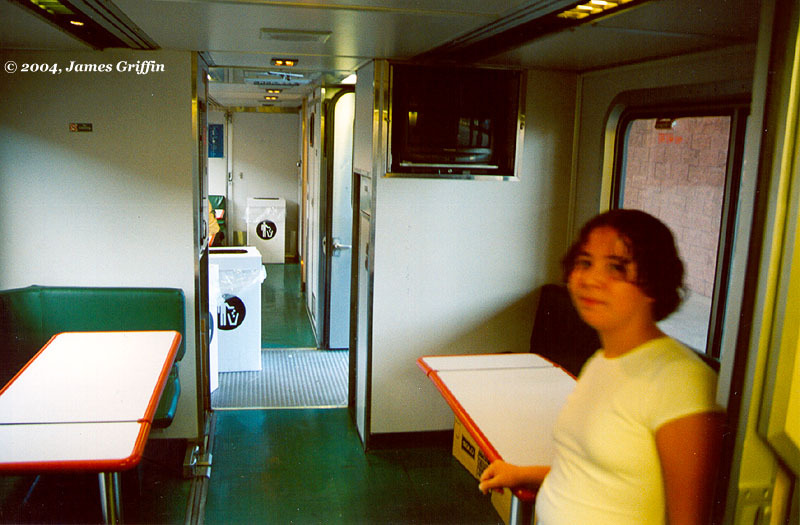 Interior of a Superliner II Sightseer Lounge car, lower level. Stairway is on the right, beyond the vestibule area. Photo taken from doorway of the lavatory, which is the full width of the car and handicap-accessible. The door at the far end leads to the concession area. The tables on the near end are designed for easy access by those with disabilities, whereas the tables at the far end are standard booths. Diners arrived in the following groups. S1 diner, number unknown. Note the window arrangement in the middle. Rather than a blank panel, there are two blanked window openings in the galley area. I have photographed a number of such cars in the past (such as 38008 below) but I suspect they’ve been more extensively modified to remove the blanked windows altogether. This photo on No. 6 in August 2001. 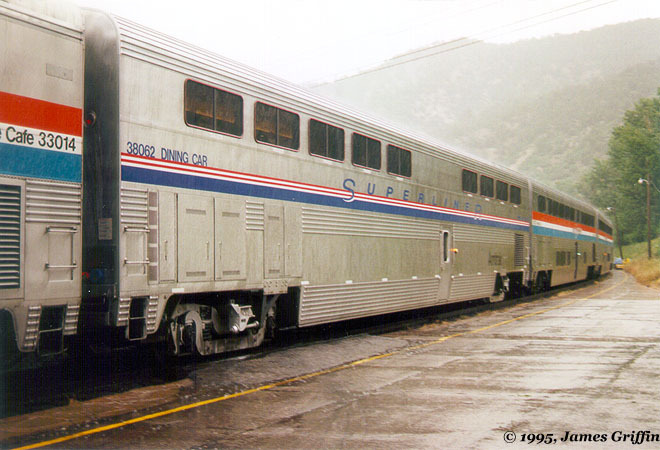 S1 Diner 38008, at Glenwood Springs on 11/30/2002. Note the blanked mid-car windows. 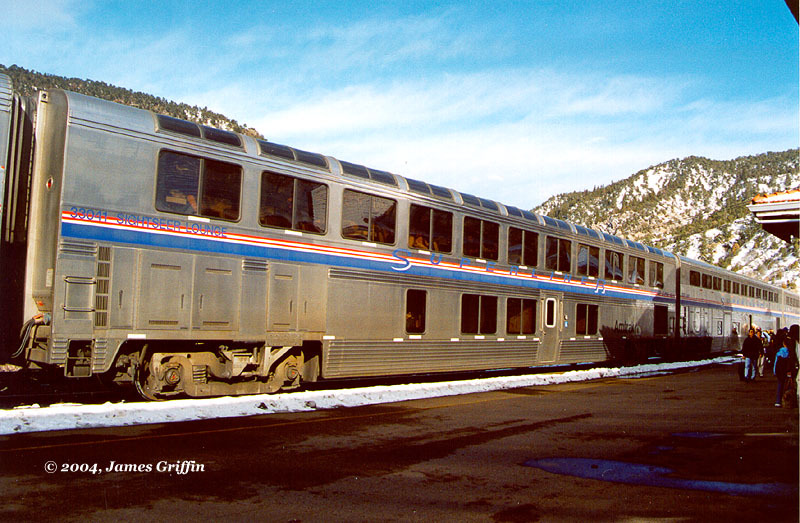 S1 Diner 38011, at Glenwood Springs on 1/1/2004. 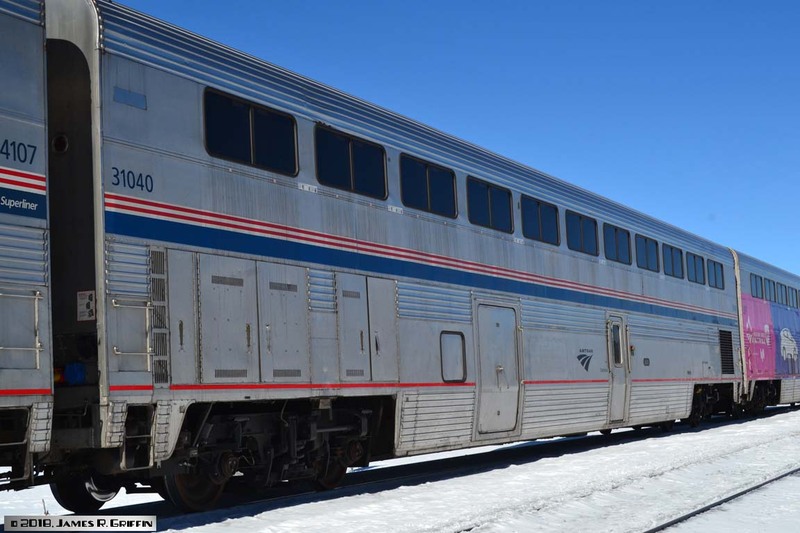 S1 Diner 38016, at Westwater, Utah on 4/27/2014, train No. 5. It has the patchy paint so common on S1 cars. S1 diner 38019, at Gallup on 9/24/2011. Phase IVb stripes. S1 diner 38021 is on No. 5 at Fraser, Colorado on 2/18/2018. S1 Diner 38036, in Byers Canyon on 8/09/2007. It’s recently been put into Phase IVb lettering (with the pale blue car numbers). S2 diner 38040, at Grants, NM 0n 8/29/2015. Train No. 4. 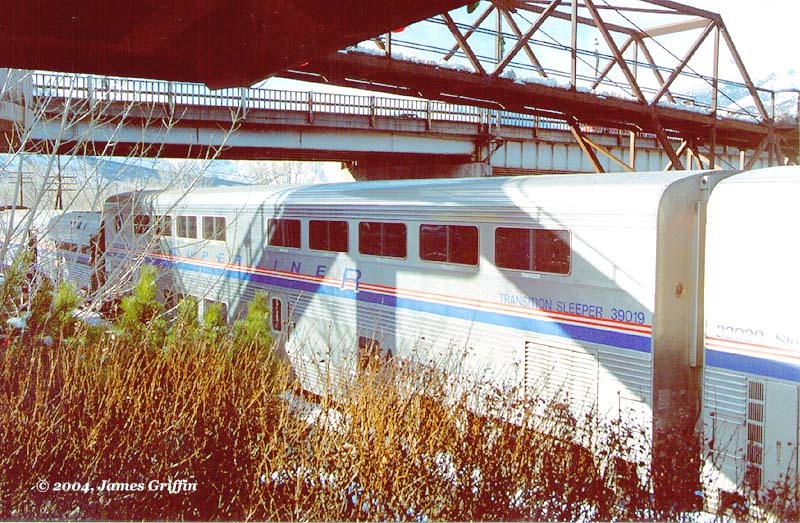 S2 Diner 38061, in Denver on train No. 5, 12/16/2014. 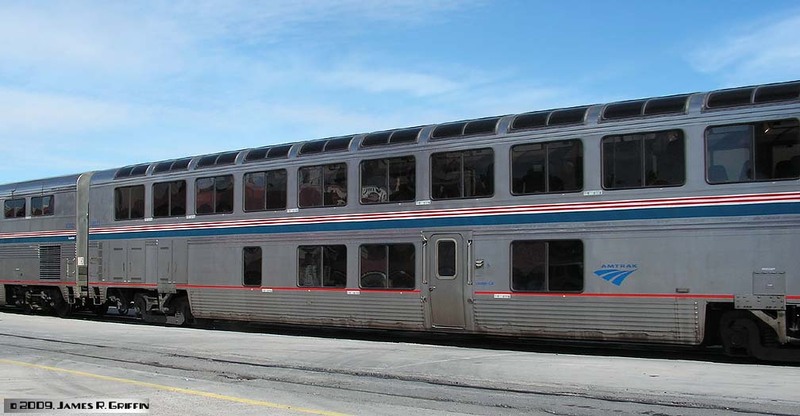 Note it still has the light blue car numbers that date from the original Phase 4b rollout. Contrast with the adjacent cars. S2 Diner 38062. It was quite new when this photo was taken on June 30, 1995. 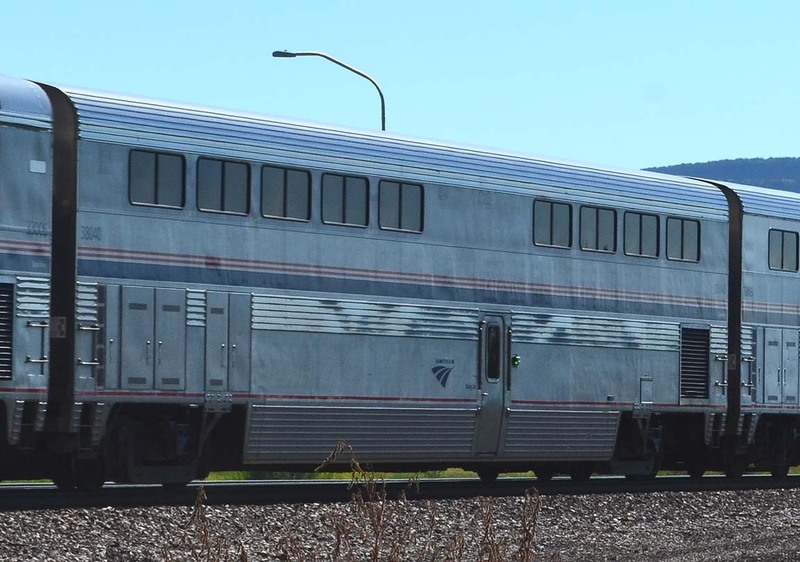 The Phase IV paint scheme with the two narrow red stripes debuted with the Superliner II series; note the other cars in the train are still in the Phase 3 scheme. By the way, food onboard contemporary Amtrak diners is first-class.